The Culp shot looks great. The degree to which his character is integral to the story and the degree to which Culp is perfect casting for that character would make the difference to me. It seems like a terrific ambition. As I have mentioned before, there were several characters on TOS that, in retrospect, would seem to me to have been perfect casting for Culp. The actors assigned to the roles did top notch jobs, t'is true, but I would love to glance into the alternate universe in which Culp played Dr. Adams ("Dagger of the Mind"), Commodore Decker ("The Doomsday Machine"), Dr. Daystrom ("The Ultimate Computer"), Garth ("Whom Gods Destroy") or Flint ("Requiem for Methuselah"). Any one of those would have been a perfect fit for his talents. He'd also have made a terrific, if very different, Gary Seven. So, yes, if I decide to indulge this fantasy, I must focus no small part of my energies on creating a character who would be right for Robert Culp! No "warm body" roles allowed! Not to thread drift too much, but Culp has always been a favorite of mine. Perhaps it's because, as JB notes, he was on the television shows I watched all the time as a kid. He had that hard to find ability of being able to play the drama and humor of a role with equal aplomb. I guess it comes down to something as simplistic as a "wink in the eye" if you know what I mean. He could be deadly serious but do it with a smile. Love his work. Culp was a very AMERICAN actor. Unlike the great British actors, who tend to burrow into their characters and submerge themselves (think Alec Guiness), great American actors tend to create a character and take it with them from role to role. Jimmy Stewart was pretty much always Jimmy Stewart, for instance. Spencer Tracy is said to have described his technigue as "This is Spencer Tracy as a cop, this is Spencer Tracy as a judge, this is Spencer Tracy as a cowboy. . . "
Culp was much like this. He was the same guy, role to role -- and yet he wasn't. Okay, THIS could mean trouble. . . .
We don't have much to go on, but what little there is suggests only Earth is a "mirror" of itself. The peace-loving Halkans, who are the only alien race we see (other than Vulcans, obviously!) are still peace loving, even in the face of potential extinction. In the ENTERPRISE two-parter (which is not necessarily to be considered canonical -- it's all a matter of perspective) we saw the Gorn and the Tholians were still pretty much themselves. As I have mentioned before, altho a classic TOS episode, and certainly one of my favorites, "Mirror, Mirror" does not stand up under close scrutiny. It's highly unlikely the I.S.S. Enterprise would have survived the encounter with Balok and the Fesarius, for instance! He had that hard to find ability of being able to play the drama and humor of a role with equal aplomb. I find similar qualities in Culp and Bruce Campbell. I've seen an episode or two of BURN NOTICE, and Campbell's role seems like one Culp could have nailed a decade or two earlier. This is really cool. The only thing missing is the sound effects of TOS. I'll have to queue some up when reading. I wonder how hard it would be to make an app with buttons that have often used sounds from TOS. "I wonder if in the Mirror universe, the Klingons are a conquered peace-loving race and adhear to a strict code of "honor through peace"... "
We saw Worf and the Klingons in one of the DS9 Mirror universe stories. It was clear the Klingons were still brutal warriors. It is only the Earth/Federation that has changed. Here's a page I cobbled together to see how well a few random shots would "meld". Some tinkering was necessary, and I hope not too obvious. I needed some dialog to complete the test, so I went for the "return of Gary Mitchell" idea. That's not to say I will do that particular story, if I ever get around to finishing a whole issue. I'm sure Greg Kirkman will tell me if that star date has already been used!! Cool. But has Sulu's head been pasted on to someone else's body? But has Sulu's head been pasted on to someone else's body? Yes. 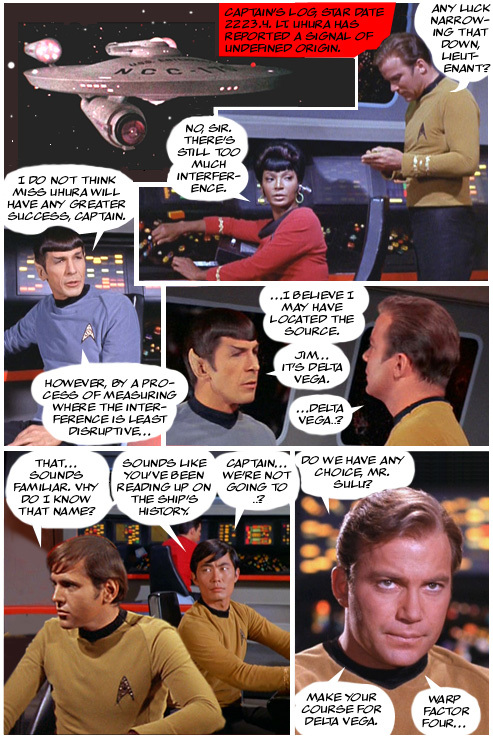 I also had to "dodge" Chekov, who was particularly dark in that panel. Like I said, these were just shots grabbed at random. If I was being "serious" about this page, I'd have spent more time finding a shot of Sulu where the lighting was an exact match. Love it. As I've expressed elsewhere, Gary Mitchell is the TOS character and story that I think most invites a sequel at this point. Other than the afforementioned Sulu head (which is no big deal), it looks great as usual. Man this is really cool stuff. That looks great-- I can practically "hear" the music. It seems to me the real challenge will come in creating new environments. Do you foresee much trouble, say, if they beam down to a new location and you want a half-splash of the "away team" against a never before seen backdrop? 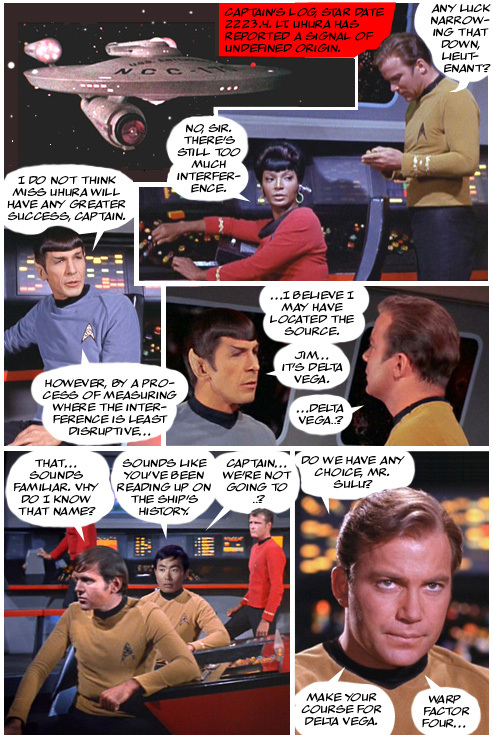 Here's the same page with a different approach to the "Sulu panel". First, LANDING PARTY LANDING PARTY LANDING PARTY LANDING PARTY LANDING PARTY LANDING PARTY LANDING PARTY LANDING PARTY LANDING PARTY LANDING PARTY LANDING PARTY LANDING PARTY LANDING PARTY LANDING PARTY LANDING PARTY LANDING PARTY LANDING PARTY LANDING PARTY LANDING PARTY LANDING PARTY LANDING PARTY!!!!!! And then… creating "alien" landscapes I would go the same route as TREK itself, using Earth environments with a little tweaking. Perusing the screen shots of "Man Trap" this morning, to be certain there were not enough to complete this project properly, I decided to amuse myself my tinkering in a TREK "tradition" that had not made itself known when this episode was filmed. I'm almost certain I've seen that red shirt wearing a blue shirt in a speaking role. Is that a manipulation of his tunic color? LANDING PARTY! I don't even watch TNG, but somehow that "away team" tag seeped into my vocab. Quite insidious. The new Sulu is seamless to my eyes. As far as "rules" go, I say throw any out the window that get in the way of your having fun, but keep just enough to keep the exercise interesting. I really like what you've done so far. When you first asked, my vote would have been for a "landscape" layout since this will be viewed primarily on computer monitors, but the more "pages" I see, the more I like the traditional comic book aspect ratio. That layout just signals "story telling" to my brain, I guess. I love the idea of guest stars. A bit of caution, though, as someone who likes to play around with Star Trek photomanipulations, when you choose your guest stars, be certain you have access to a wide variety of photos to use. 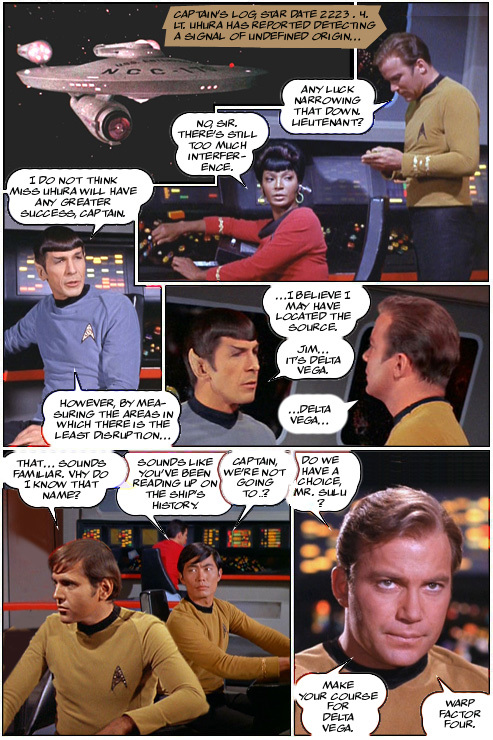 Screen captures are available for few if any shows from that era or any era in nearly the number that are available for Star Trek, and I sometimes find it difficult to find one useable image of an actor, let alone enough to do a comic. Maybe one more piece of advice -- when you see an image you think will work well, grab it RIGHT NOW. I've gone back for images too many times that are either no longer where I saw them or I can't remember where I saw them. When I was thinking about a Robert Culp appearance, the first thing I did was a web search for appropriate vintage images. There were quite a few, but thinking in terms of an average comicbook character, close to 100 might be needed. Here's another pass at the test page, this time with more formalized balloon shapes, and a slightly smaller font. I can already see I will have to be doing some manual manipulation of the lettering, after I have "flattened" the layers. Good to be learning these things before I embark upon the major project. I'm thinking, too, that it might be a good idea to create these pages in a large size, and then scale them down for posting. It would "intensify" the images, and also make the "Find Edges" function, which I used on the balloons on this one, work more cleanly.